It is my pleasure to welcome you to the So Klose website. I hope the information here provides you with a greater understanding of our company, our services and our core beliefs. We are passionate about facilitating relationships between like-minded individuals and helping the busy singles to explore romance and find true love. Since inception, So Klose has witnessed many accomplishments. We are grateful for our growing list of clients who teach us something new every day with their desires, stories, struggles, hopes and experiences. We are also pleased with the results we have made – growing number of our clients end up marrying! We meet every member in person and match them according to what they are looking for. We do not believe in blind dating. We provide clear personal details with photos for matching. We have made it clear that we only accept people who are interested in pursuing a serious, committed and long-term relationship. We are compassionate, and we work with integrity and honesty. Everyone is different and there is no one-size-fits-all when it comes to relationship. You have to meet a lot of people before you can appreciate the right one. Remember that a relationship consists of two people, and both parties should have an equal say. You should never be afraid to express your feelings but it doesn’t mean you speak up for yourself only. You should also listen and practice putting yourself in your partner's shoes. Both parties should work hard to communicate effectively. In view of the growing number of deception in social networks, imbalance of gender ratio and trends in long work hours, it is difficult to meet someone who is really committed in today’s world. As a result, it drives today’s urban singles to more personalized services where they expect real results. By the end of 2009, I opened So Klose dating and matchmaking services in Hong Kong as I hope to revolutionize the traditional matchmaking and dating services. Our vision is to create an exceptional new culture of matchmaking and dating services for singles that are looking for long term or serious relationship. Be open yourself to others; give people and yourself a chance. 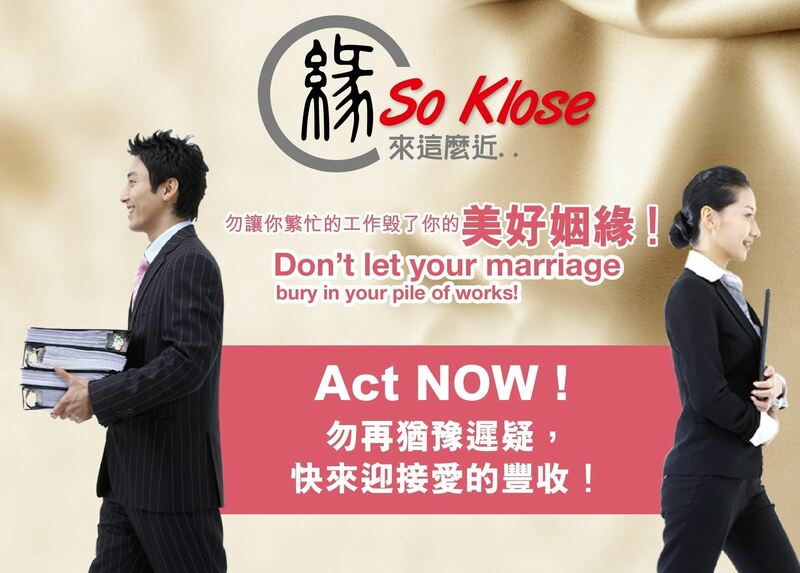 Today, So Klose is a leading and multi award-winning matchmaking and dating services company in the Chinese community. Our clients come from different education backgrounds and all walks of life. Besides providing private search for never married singles, we have also added services for the divorced singles and mature age group singles in the recent years. As the most trustworthy matchmaking and dating services company, we are the first and the only ISO9001:2008 certified company in the Chinese community. We are also an executive member and certified matchmaker of The Matchmaking Institute in New York. At So Klose, we strive, ultimately, to deliver on our brand promise to be The Customers’ Preferred Matchmaking and Dating Services Provider. All this is thanks to the incredible support we have received. We are looking forward to hearing your story soon!